Peter Sacco, President & Founder, PTS Data Center Solutions, recently wrote a new white paper on UPS Configuration Availability Rankings. Reliance on technology has elevated data center availability from a lofty goal to an absolute necessity. As such, the configuration of the UPS system is vitally important in achieving high-availability with respect to the power side of the universe. This paper explores a number of different UPS configurations, how they contribute to availability, and who manufactures them. 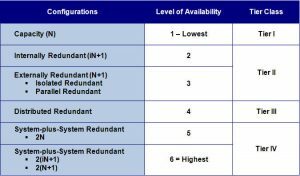 Pete’s conclusion is that UPS configurations depend upon a number of factors including: level of availability required/desired (i.e. Tier class), IT load requirements, power input, and budget. Understanding these factors and their impact on UPS configuration and design will result in a suitable UPS purchase to meet user and IT load requirements. For the complete white paper, please visit the PTS Media Library (log-in required) or contact us to receive a complimentary PDF.